Within the next few years, some vehicle manufacturers will be mass producing self-driving cars that have the ability to steer, brake and guide themselves. The capabilities of these first generation autopilot systems won't make a vehicle completely autonomous or capable of driving without human input or intervention, but eventually self-driving driverless cars that are fully capable of transporting their passengers from A to B without a human hand touching the steering wheel will be a reality. European, Asian and domestic auto makers as well as Google, numerous colleges and the military are all working to perfect self-driving and driverless technology that will make vehicles easier and safer to operate by reducing or totally eliminating accidents caused by human error (which accounts for most accidents). 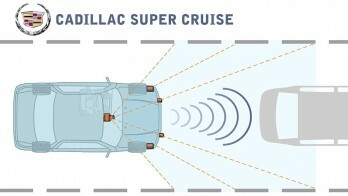 General Motors "Super Cruise" system, which was offered on a few MY 2017Cadillacs offers autopilot functionality for highway cruising and even some urban driving. Cadillac plans to expand the availability of Super Cruise across the entire Cadillac product line beginning in 2020. After 2020, Super Cruise will make its introduction in other General Motors brands. There are a couple approaches being taken with this new technology. A Self-Driving car is one that still have a human driver behind the steering wheel, but can take over all driving functions in an autopilot mode so the driver can enjoy hands-free driving. The driver can resume full control of the vehicle at any point, as functions as a safety backup in case the self-driving system malfunctions. A driverless or autonomous vehicle, on the other hand, requires no human operator. It is essentially a robotic vehicle capable of hauling passengers or cargo to a predetermined destination. It communicates with other vehicles, roadside traffic controls and the internet by means of Telematics. Are Self-Driving Cars (and trucks) a Good Thing or a Bad Thing? Drunk drivers cause roughly one third of all traffic accidents and fatalities. If a vehicle can take over for an intoxicated driver, that should greatly reduce the number of alcohol-related accidents and deaths. Distracted driving has also become a leading cause of car accidents. Keeping drunks off the road and eliminating the need to keep your eyes on the road should be a good thing, right? The downside it that the number of tickets and arrests for DUI could plummet, causing a severe drop in revenue for local government and DWI/DUI lawyers. Insurance companies would also take a hit because they couldn't jack up your insurance rates for a DUI. On the other hand, they would be paying out fewer claims for accidents caused by distractred driving too. Self-driving and driverless autonomous vehicles would obey all posted speed limits and traffic control signs. This would reduce the danger of speeding in work zones, school zones and congested traffic. But it would also reduce a huge source of income for local and state governments that comes in the form of speeding ticket and other traffic citations. This, in turn, might reduce the need for so many traffic cops, red light cameras and speed cameras. Sleepy drivers who doze off and plow into other vehicles or run off the road cause an estimated 56,000 accidents a year, according to the NHTSA. These kind of accidents result in 40,000 injuries and 1550 deaths. A vehicle that could detect a sleep deprived driver or a driver who is falling asleep and assume control of the vehicle could prevent most of these accidents and injuries. The downside? Fewer crashes means fewer repair claims to insurance companies, fewer collision repairs for body shops, fewer repair parts sold to fix collision damaged vehicles, fewer injuries for doctors to treat, and fewer lawsuits for auto-related accident injuries and disabilities. 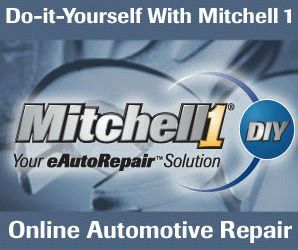 This could reduce the need for insurance claims adjusters, body repair technicians, ambulance drivers and trial lawyers. Vehicles that can drive themselves should reduce accidents caused by drunk driving, distracted driving and human error. Hands-free driving would allow drivers to pursue other activities while traveling, such as texting, reading email, checking their FaceBook page, watching YouTube videos or streaming video, eating, napping or whatever. The driver can be totally disconnected from the driving experience, relying solely on technology to direct his vehicle to his destination. The driver just becomes another passenger. This is fine for a vehicle that is truly autonomous and can drive itself from start to finish, but may not be so safe for a vehicle that may return control to the driver at an inopportune moment when the driver is distracted by some other activity. Driverless fully autonomous vehicles that need no driver at all (not even for a backup) will eventually come once the self-driving technology has proven itself, but there could be major economic consequences. Cabs would not need cab drivers. Trucks would not need truck drivers. Buses would not require bus drivers. This could put a LOT of people out of work who are presently employed in these occupations. Over-the-road trucks with no driver behind the wheel could theoretically run 24 hours a day (or until they needed to stop for fuel), thus lowering the cost of transporting goods. There would be fewer car-truck accidents because there would be no fatigued, distracted or angry truck drivers behind the wheel. But that would eliminate the customer base of interstate truck stops that rely on truckers supporting their business. It would also put a lot of truck driver schools out of business. monitor vehicle location, traffic and driving conditions. The technology has already proven that a human driver is not needed to pilot a vehicle. If Audi can send a driverless car up Pikes Peak at race car speeds without plunging off the road, the same technology can surely keep a car or truck in the same lane on the open highway or help it navigate urban traffic. A self-driving car or driverless autonomous vehicle should also be fully capable of recognizing and avoiding pedestrians, animals and other obstacles in the road. Most of the early prototype driverless autonomous cars required a trunkfull of computers, bulky cameras and antennas to self-navigate. But as the technology evolves it becomes smaller, more efficient, more reliable and cheaper to manufacture. Some car makers say they can probably mass produce self-driving autopilot cars for less than $3,000 in added manufacturing costs. The first systems will only be available in luxury vehicles, but as costs come down the technology will likely spread to all cars, just like airbags, antilock brakes, tire pressure monitoring systems and stability control. And like these other safety technologies, some type of electronic driving aide may eventually be required by law on ALL vehicles that operate on public roads. This, in turn, would mean older "manually operated" vehicles would be restricted to certain types of roads or banned from congested urban areas where traffic lights may become a thing of the past. With fully automated driving control systems and communication between vehicles, many urban roads could theoretically handle higher volumes of traffic than they can safely handle now. Same for expressways. Reliability is still a huge concern for many people. A self-driving car or autonomous vehicle would have to have redundant fail-safes built in to prevent a runaway car or a car that suddenly loses track of where it is or where it is going due to some electronic failure or glitch. The system would have to revert control (with adequate warning) back to the driver, or if there was no driver to pull the vehicle off the road and shut it down. Legal issues. Nevada was the first sate to legalize the use of self-driving cars on public highways. California has also approved self-driving cars, and other states are considering similar legislation. Another concern is liability. 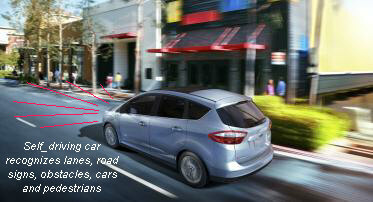 Who is responsible if a car that drives itself is involved in an accident or crashes? Who do you sue? The vehicle owner? The vehicle manufacturer? The company who designed the self-driving system? How would such a vehicle be insured? Insurance companies would have a hard time justifying high premiums and annual rate increases for vehicles that would likely be much safer than today's vehicles and would likely experience fewer accidents and claims. That,in turn, could mean a sizable drop in insurance premiums (and profits for the insurance companies!). Privacy is another concern, at least for some people. If a vehicle can drive itself an navigate from A to B, it must keep track of its location at all times. This means a vehicle's whereabouts could be easily tracked for any number of reasons. Parents could keep track of their teenagers. A jealous spouse could keep a watchful eye on their partner to make sure they don't stray. Law enforcement could monitor the travels of various individuals who might merit watching. Who would have access to this information? Just law enforcement? Just Google? Or anybody? Could the information be hacked? Would rules be put in place to restrict the use of this kind of driving information? Google would love to track people and build profiles of their travel habits so they could better market all kinds of advertising and services to motorists. Imagine being bombarded with localized targeted advertisements as your vehicle drives past restaurants, gas stations, stores, car lots, you-name-it. It could open up a whole new way to market to motorists. These are all issues that must eventually be dealt with and resolved. There will be missteps and mistakes made along the way, but self-driving cars and driverless autonomous vehicles are coming. It's just a question of when. Some say within 20 to 25 years, the majority of vehicles on the road will either have self-driving capability or be fully autonomous. The only places where drivers will still be able to wrap their sweaty little fingers around a steering wheel will be on remote rural roads, when driving off-road or on a race track. The National Highway Traffic Safety Administration (NHTSA) classifies vehicles according to their level of sophistication, from Level 0 (no automation at all) to Level 4, which is full self-driving automation. A Level 4 vehicle would be one that is designed to perform all safety-critical driving functions and monitor roadway conditions for an entire trip. The only driver input required would be for destination or navigation input, or to resume control of the vehicle should a failure occur in the guidance system. Vehicles that do not require the driver's input for various functions can be beneficial, and some consumer surveys show that motorists appreciate such features as adaptive cruise control, emergency braking and parking assist. But NHTSA says it will continue to evaluate the safety of self-driving cars before it gives its full approval. NHTSA is also studying how drivers interact with autonomous driving systems, and whether or not this poses any safety issues. Their research will also determine whether or not special training and licensing may be required for motorists to operate such vehicles. Volvo Cars is playing a leading role in the world's first large-scale autonomous driving pilot project. One hundred modified self-driving Volvo cars will be put on public roads in everyday driving conditions around the Swedish city of Gothenburg. The project is supported by the Swedish government, which sees self-driving cars as a way to reduce accidents and improve driving safety. Feedback from the real world pilot project will help Volvo refine the technology that will eventually go into production vehicles. The goal is for the car to be able to handle all possible traffic scenarios by itself, including leaving the traffic flow and finding a safe place to pull over if the driver is unable to regain control. How autonomous vehicles bring societal and economic benefits by improving traffic efficiency, the traffic environment and road safety. The project starts this year with customer research and technology development, as well as the development of a user interface and cloud functionality. The first cars are expected to be on the roads in Gothenburg by 2017. Volvo self-driving car interacting with its surroundings and other vehicles. The car can even park itself without a driver in it. A research vehicle designed by Delphi was the first vehicle to successfully drive coast to coast using self-driving technology. The specially equipped Audi Q5 SUV traveled from New York to San Fransisco, a distance of 3400 miles on auto pilot for 99 percent of the trip. The test engineer who sat in the driver's seat barely touched the steering wheel or pedals during the entire trip, except for a few instances were road construction made accurate navigation difficult. 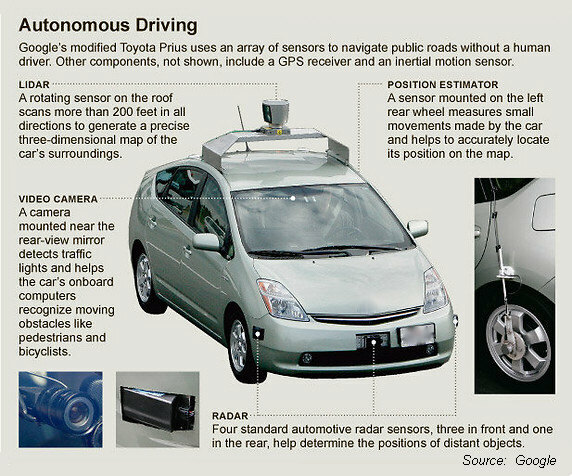 The test vehicle was fitted with six lidar sensors to measure distances, plus four short range radars and three cameras to watch the road. Tesla beat all of the other auto makers by introducing the first "Autopilot" system that is fully capable of driving, steering and braking the car in a special cruise control mode. Although this system is not a full blown self-driving car, it's pretty darn close. It allows hands-free driving in most traffic situations. Even more unique is the fact that the new Autopilot system was sent wirelessly to Tesla owners as an upgrade download. The vehicle did not have to be returned to a dealer for modifications. Also, there was no charge for the upgrade. Tesla's commitment to developing and refining the technologies to enable self-driving capability is a core part of our mission. In October of last year we started equipping Model S with hardware to allow for the incremental introduction of self-driving technology: a forward radar, a forward-looking camera, 12 long-range ultrasonic sensors positioned to sense 16 feet around the car in every direction at all speeds, and a high-precision digitally-controlled electric assist braking system. 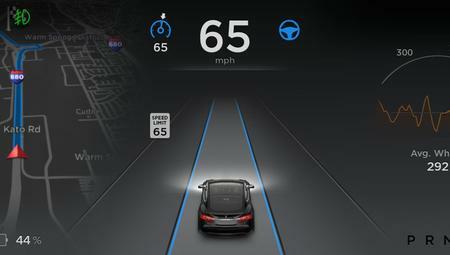 Today's Tesla Version 7.0 software release allows those tools to deliver a range of new active safety and convenience features, designed to work in conjunction with the automated driving capabilities already offered in Model S. This combined suite of features represents the only fully integrated autopilot system involving four different feedback modules: camera, radar, ultrasonics, and GPS. These mutually reinforcing systems offer realtime data feedback from the Tesla fleet, ensuring that the system is continually learning and improving upon itself. Autopilot allows Model S to steer within a lane, change lanes with the simple tap of a turn signal, and manage speed by using active, traffic-aware cruise control. Digital control of motors, brakes, and steering helps avoid collisions from the front and sides, as well as preventing the car from wandering off the road. Your car can also scan for a parking space, alert you when one is available, and parallel park on command. Wow! It sounds like fully autonomous driving is closer than we think! The latest predictions by auto makers is that 2020 will be the year of the self-driving car. Audi, Tesla, Toyota and other auto makers says that by 2020 they plan to have vehicles that are fully capable of meeting "Level 4" self-driving capabilities. That means the car can drive itself from point A to point B with no driver input other than giving general directions as to where they want to go. Achieving that level of sophistication has taken longer than initially thought due to the complexities of assuring the cars willb e 100 percent safe. The evolving technologies that are making autonomous travel possible include advanced computer processors, advances in artificial intelligence and decision making software, image recognition software, advanced sensor designs including digital cameras, Lidar (laser imaging) and radar sensing. Lidar can provide high resolution imaging in rain or snow, day or night, and can supplement images provided by onboard cameras to determine what's going on around a vehicle. Vehicle-to-vehicle communications will also play a big role in autonomous driving, as will vehicle-to-infrastructure communications. Fully autonomous vehicles have to perform a variety of tasks beyond speed control, steering control and braking. They have to know their exact location (via GPS) on the road, they have to determine and maintain their correct lane position on multi-lane streets and highways, they have to recognize other vehicles, pedestrians, cyclists, cars, animals, road hazards, traffic signals, and road signs (and react accordingly to prevent collisions), they have to flow and merge with other traffic and react to the driving intentions of other vehicles (turning, lane changing, braking, etc. ), they have to obey speed limits, stop signs and stop lights, and they have to work 100 percent of the time in all types of driving conditions (day, night, rain, snow, ice and fog). It's no simple task to engineer a vehicle that can do all of these things with absolute reliability and safety. Even so, auto makers are confident that they are mostly there now, and will be able to produce fully autonomous vehicles by model year 2020 or 2021. Williston, FL. A Tesla on Autopilot failed to see a tractor trailer turning across the road, mistaking the trailer for an overhead road sign. The car did not brake and hit the trailer, shearing off the top of the car and killing the driver. The vehicle was in Autopilot mode but the driver was not paying attention and was watching a video player in his lap at the time of the accident. Tesla has warned users that their current Autopilot mode is for use only on expressways where there are no intersections and no cross traffic. It's basically just a really smart cruise control, not a fully functional autonomous self-driving system that can react to every possible traffic hazard. Tempe AZ. A female pedestrian pushing a bike across a street at 10 pm was hit and killed by a self-driving UBER car. The car even had a human test driver to monitor how well the car was performing, but apparently neither the human driver or the road sensors detected the pedestrian in time to prevent the accident. Mountain View CA. A Tesla Model X on Autopilot warned the driver to take control as it approached a highway construction zone, but the driver failed to respond and the car hit a concrete barrier. Ft. Lauderdale FL. Two teens were burned to death when a Tesla failed to navigate a sharp turn, hit a wall, crashed and burst into flames. Officials say speeding was a factor. 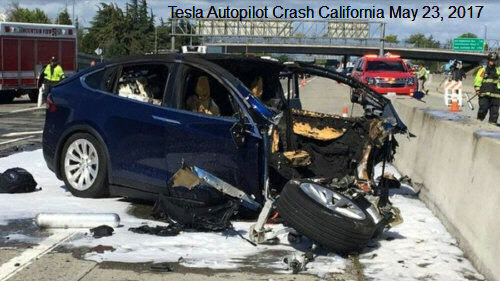 Whether autopilot was engaged at the time of the accident has not been reported, but the accident does illustrate the potential fire hazard of lithium ion batteries if the battery pack is damaged in an accident. Bellinzona Switzerland. 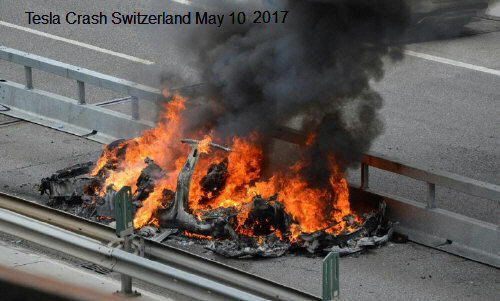 A Tesla traveling at high speed on a highway hit a barrier, flipped and burst into flames, killing the driver. No information yet as to whether Autopilot was engaged, but yet another example of the potential fire hazard of high voltage battery packs in electric vehicles. South Jordan Utah. 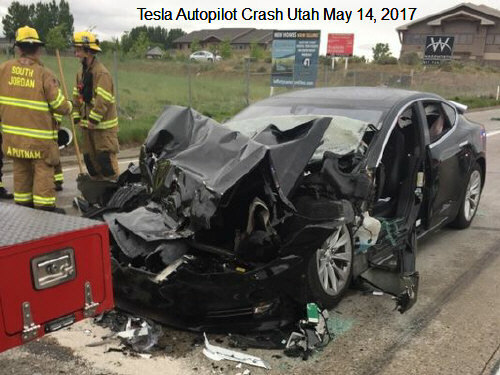 A Tesla driving 65 mph on autopilot failed to recognize a fire truck stopped on a highway and slammed into the back of the truck. The driver was injured and suffered a broken ankle. 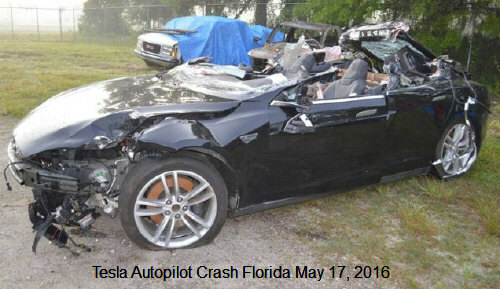 The driver of a Tesla Model 3 was killed near Dayton FL when a tractor trailer truck pulled across the highway and the car passed underneath the trailer. The collision sheared off the top of the car. The car continued on for another3/10ths of a mile before coming to a stop. Apparently, neither the Model 3 driver nor the autopilot system recognized the trailer in time to apply the brakes. 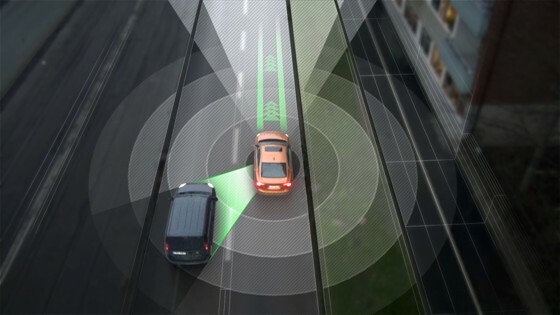 Deloitte’s 2019 Global Automotive Consumer Study finds that consumer trust in autonomous vehicles (AVs) appears to be stalling, along with trust in U.S. auto manufacturers ability to bring these technologies to market. The study, which surveyed over 25,000 consumers across 20 countries, found that consumers’ appetite for self-driving vehicles is lagging behind the industry’s pace of investment in advanced vehicle technology. Public perceptions about safety slow down: The number of respondents in the U.S. who did not believe AVs will be safe decreased from 74% to 47% from 2017 to 2018. From 2018 to 2019, however, that percentage only changed from 47% to 50%, showing a plateau in consumer trust. People are also wary of data collection and privacy: When it comes to connected vehicles, roughly two-thirds (63%) of U.S. consumers are concerned about biometric data being captured and shared with external parties. Trust in traditional auto manufacturers has also eroded. There is an ongoing lack of trust in the private sector with a majority of U.S. consumers (56%) indicating they want significant oversight from the government in AVs. Furthermore, the number of respondents who trust traditional original equipment manufacturers (OEMs) to bring AV technology to market continues to fall – slipping from 47% in 2018 to 39% in 2019. What's Driving the Discussion on Autonomous Vehicles?